The Xi3 Piston was originally touted as the first Steam Machine (back before Valve had even announced its Steam box plans) but Valve soon distanced itself from the shiny box, despite initial claims that it had invested into it. And so the Piston wasn't among the roster of initial Steam Machines. The reason? Xi3 sees it safer to bank on wider Windows right now and isn't quite ready to jump ship. "We've gone separate directions today – that doesn't mean we're not supporting Valve," said Xi3 CMO David Politis in an interview with PC Gamer. "They've got 50+ million users on Steam. Why wouldn't you support them? But the thing is, so does EA, with Origin. So we support Origin as well. In fact, we believe that if you can play it on a computer you should be able to play it on a Piston." $999 (about £605, AU$1105) would be a big asking price for something that's built primarily for Valve's new SteamOS. The biggest concentration today is in the Windows marketplace," said Politis. Many of the Steam Machines announced at CES are coming with a hefty price tag, and not everyone has faith that they can undercut the other consoles without bringing down the premium. 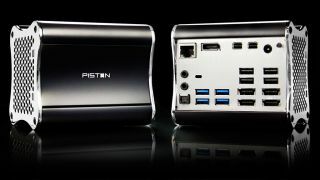 The Piston, however, is designed to be upgrade able, and for now Xi3 doesn't plan to join the other Steam Machines that have been announced. "Today it does not make sense," said Politis. "Based on the announced pricing, we expect a very small sub-segment of existing Steam users, who are keen to bring their PC gaming into the living room, as the main buyers of Steam machines," said IHS analyst Piers Harding-Rolls. "While the ambition of Valve is to broaden the audience for its Steam community and games distribution platform, the high cost of the current collection of Steam machine prototypes means that this ambition is likely to be significantly undermined." Which Steam Machine should you buy?